Alas, December has hit with a vengeance and my still-remaining collection of GRAVY posts has been relegated to a back burner - so to speak. They ARE there and WILL be posted, just maybe not as soon as I planned. I've had other things to entertain me though. 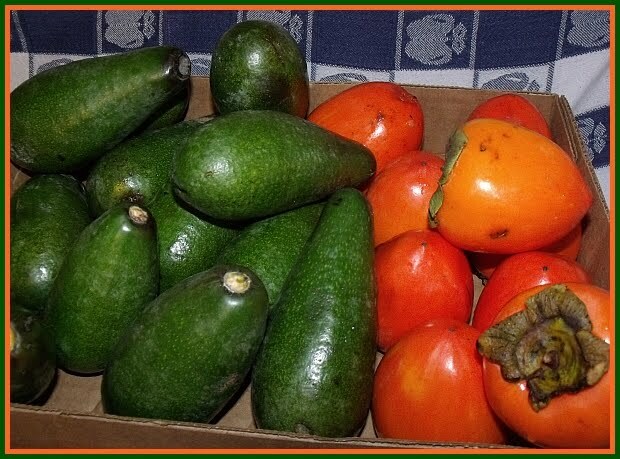 My dear cousin in California just sent us this HUGE package of avocados and persimmons and while the avocados are ripening VERY slowly in my cool garage, the persimmons have all decided to ripen at once and I was left wondering what exactly to do with them. I love persimmons, but they are a peculiar and often misunderstood fruit. The Hachiya persimmons (like the ones in my garage) are large, heart shaped and need to be eaten ONLY after they've ripened to a super-soft, jello- or-custard-like consistency. No, it might not sound appetizing at first, but they really are delicious. I sometimes freeze the ripe ones and they're especially delicious straight out of the freezer - like eating sorbet! 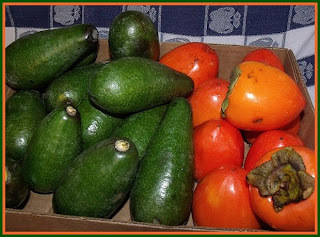 The squatty, Fuyu persimmons can be eaten when firm (like a ripe pear) and dark orange in color, I especially like them cut up in fruit or green salads. Since all 16 persimmons decided to ripen at once, I decided to put some of the fruit into a bar-cookie recipe, more specifically for an entry in the Earth Balance/Whole Foods Holiday Bake-Off contest. My recipe is here: (Persimmon Bars) but I'll also post the whole recipe here on my blog, in case you're too lazy to click on the link. 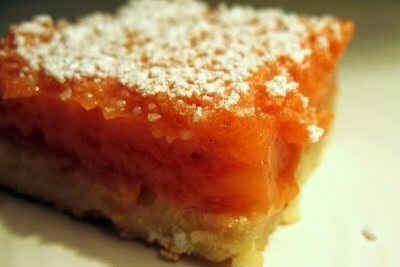 They're modeled after lemon bars, but the mellow, sweet persimmon filling makes them into something quite different. 1. Grease a 9 X 13 pan. Preheat oven to 350 degrees. 3. Put the flour, wheat germ, powdered sugar and cornstarch in food processor. Add Earth Balance margarine in spoonfuls and "pulse" (turn it on and off) each time, 8 to 10 seconds, and then, if needed, after all the margarine is added, pulse again until mixture resembles coarse meal. 4. Spoon the crust mixture into the baking pan and press firmly into an even layer with slightly raised sides to hold in the filling. 5. Refrigerate for about 30 minutes and then bake for 40 min. 6. Remove from oven. Let cool. While it is cooling, make the custard filling. 8. Soak the agar-agar flakes in the water for 15 minutes. While it is soaking, put persimmon pulp in food processor and blend until smooth. Mix the arrowroot and lemon juice into persimmon pulp and blend well to dissolve arrowroot. 9. Put agar-agar mixture into a saucepan and bring to a boil. Boil about 10 minutes until completely dissolved. Add sugar and boil about two or three more minutes. 10. Lower the heat to medium-low and add the arrow root and persimmon mixture, then add the soy milk. Whisk constantly over med-low heat until the mixture thickens. About 5 minutes. 11. Pour cooked mixture into prepared crust. Let it cool about 20 minutes, then refrigerate for 2 - 3 hours or until set up and only slightly jiggly. Sift powdered sugar over the top. Cut into bars and serve. THANK YOU for the persimmon recipe! I have a couple of persimmon trees and tons of fruits and have been on the look out for good recipes since the end of summer. These looks tasty! Great recipe! I have to admit, I probably won't be making it as it's expensive to buy lots of persimmons. I tend to like the Fuyu better; Hayicha are nice and sweet on the inside, but the skin is still bitter. Makes them hard to eat! Dianne, I imagine they are expensive in some areas. I get them from family in California, otherwise I don't think I would have ever tried them. Never eaten the skin, I cut the fruit in quarters, hold it like a tiny slice of watermelon and sorta 'slurp' up the fruit. I think I tried a Hachiya persimmon maybe once, only because I grew up on Fuyus and I have always pretty much adored the things. These bars look like a super-tasty excuse for familiarizing myself with Hachiyas. :) Thanks for sharing the recipe! I have never liked persimon, but looking at these bars I am now willing to give them another go. Oh man, how did I miss this in December, when I had a huge bag of persimmons?! The persimmon pulp I used was a very pretty deep orange. It's been a while, so I don't remember for sure but I may have tweaked the picture to make it a BIT brighter but it definitely wasn't a dull brown.